I like to think of defining flesh and bones as setting the steps. You have a strategy, you've got the heart of your business settled, but you want to set it down into concrete steps you can follow and track. Good business planning is nine parts implementation for every one part strategy. So here's what's in this chapter. whatever else you're doing, you should be aware of the cash traps. Action Plan: What’s Going to Happen? When? I call it an action plan but in some ways that's just another buzzword. The real flesh and bones of your plan is what's going to happen, when, who's going to do it, how much is it going to cost, and how much sales will it generate. Strategy is nice, but the real plan-as-you-go business plan is about specifics that you can track and manage. And that's the flesh and bones of the plan. 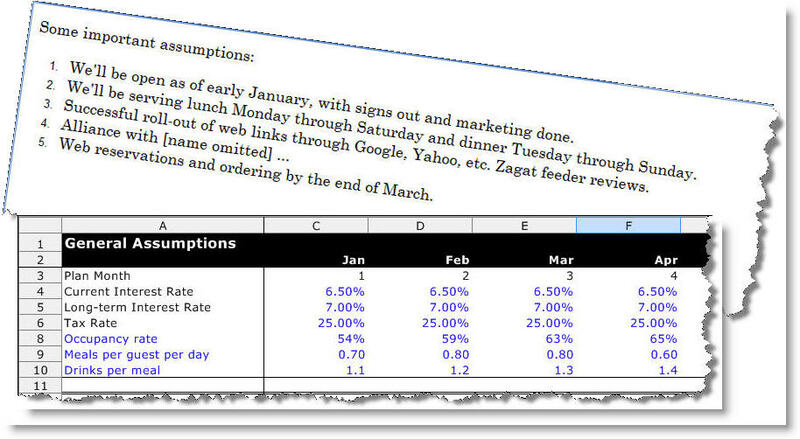 Here's one element of the plan-as-you-go business plan that you won't see automatically on most other business plan outlines or formats: the review schedule. 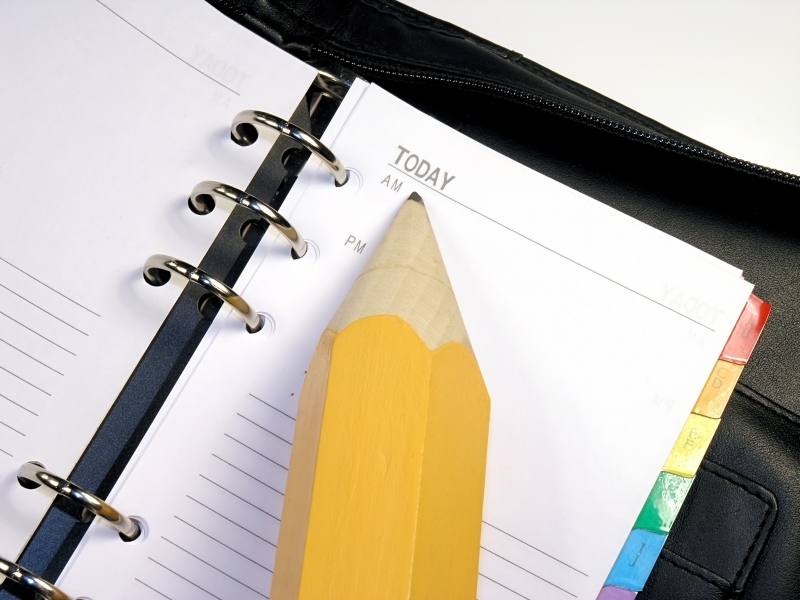 One of the lesser know, but more important, facts about planning is that every business plan needs a review schedule. People have to know when the plan will be reviewed, and by whom. For example, in Palo Alto Software we established the third Thursday of every month as the "plan review meeting" day. In the old days we brought in lunch and took over the conference room. It wasn't a big deal. We were done in 90 minutes. But we scheduled all the meetings as part of the next year's plan, and key team members knew they should be there, and wanted to be there. Absences happened, but only when they were unavoidable. I speak in the past tense only because after our UK subsidiary managing director was added to the group, those lunch meetings became morning meetings. Our 9 in the morning is London's 5 in the afternoon. Then in 2007 when the new management team took over, the review meetings moved to Wednesdays. But we still have them. Try to always start your review meetings with an initial discussion of key assumptions. This is why I say elsewhere that it's so important to list those assumptions where they stay on top of mind. Mind the discipline of keeping changes in strategy and changes in assumptions related to each other. Keep review meetings as short as possible. One of the biggest threats to efficient effective planning process is too much time in meetings discussing the same things. Emphasize metrics. Focus on concrete specific details. Metrics are most important. How do actual metrics compare to plan metrics. Variances, meaning the differences between plan and actual, should be discussed. The obvious metrics are the financial results, but don't let those be the only metrics (refer to Develop Metrics). Be keenly aware of the "crystal ball and chain" phenomenon. The risk is that planning becomes a no-win game in which people commit to future metrics that come back to bite them. It's as if it were a management trick to hold over people's heads. Don't let that happen. Make sure planning is collaborative, so that it is always understood that change can happen and when it's managed, is good. Planning helps us manage change; it isn't really just to keep track of how bad we are at predicting the future. Remember, your business plan is always wrong. Identifying assumptions is extremely important for planning process and the plan-as-you-go business plan. Planning is about managing change, and in today's world, change happens very fast. Assumptions solve the paradox between managing consistency over time, and not banging your head against a brick wall. Assumptions might be different for each company. There is no set list. What's best is to think about those assumptions as you build your metrics, including sales forecasts and expense budgets, and write them out as much as possible. The key here is to be able to identity and distinguish between changed assumptions and the difference between planned and actual performance. You don't truly build accountability into a planning process until you have a good list of assumptions that might change. Some of these assumptions go into a table, with numbers, if you want. For example, you might have a table with interest rates if you're paying off debt, or tax rates, and so on. Many assumptions deserve special attention. Maybe in bullet points. Maybe in slides. Maybe just a simple list. Keep them on top of your mind, somewhere where they'll come up quickly at review meetings. Think about event assumptions. Or date assumptions. Maybe you're assuming starting dates of one project or another, and these affect other projects. Contingencies pile up. Maybe you're assuming product release, or liquor license, or finding a location, or winning the dealership, or choosing the partner, or finding the missing link on the team. Maybe you're assuming some technology coming on line at a certain time. You're probably assuming some factors in your sales forecast, or your expense budget; if they change, note it, and deal with them as changed assumptions. You may be assuming something about competition. How long do you have before the competition does something unexpected? 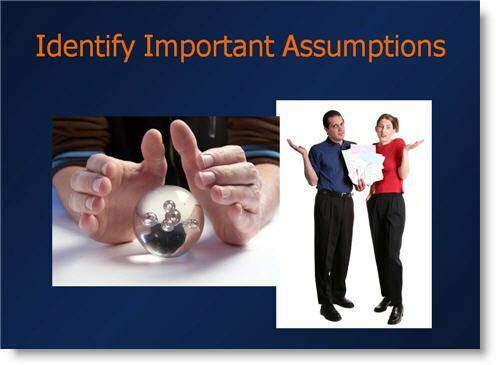 Do you have that on your assumptions list? 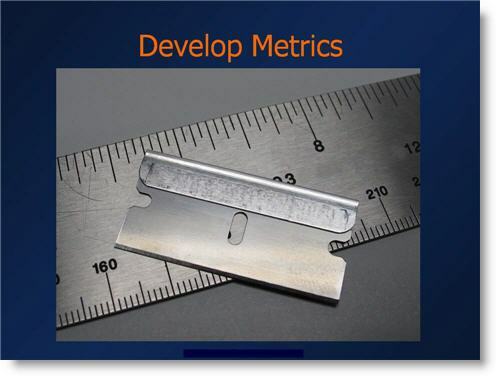 Metrics are a critical element of the plan-as-you-go business plan. The planning process requires pulling people into the regular review schedule and helping them care about performance and results. For that, you need to develop metrics. All human beings in any kind of a job need some way to assess their own performance that's objective. It might not be numerical or easily quantitative, but it's somewhat objective and observable by them, because then they are not left to depend upon the opinion or the whim of a manager once a year during a performance appraisal. People need to be able to go home from work every night, or every week, or every month, and know where they stand, and know what they can do to influence how they're working. This is why sales people are generally very satisfied in their job, because they have very clear evidence of their performance. Most people think they are coin operated, but in fact a quota is a wonderful scoreboard for them evaluating themselves, and all people need that. Sometimes it requires a manager to be very creative in how they come up with that. In my book this one guy works at the drive-through window in a fast-food restaurant and the manager helps him realize that the best way he can measure the impact of his success is to find how many times he can make somebody smile or laugh that comes through his line. So he writes down or records for himself how often he can do that. We have to give people that sense that they have some measure of control. This is about metrics. Find ways to help people track progress towards goals. Build numbers into your plan so people can see their own progress, and peers can see each other's progress. The most obvious metrics are in the financial reports: sales, cost of sales, expenses, and so on. 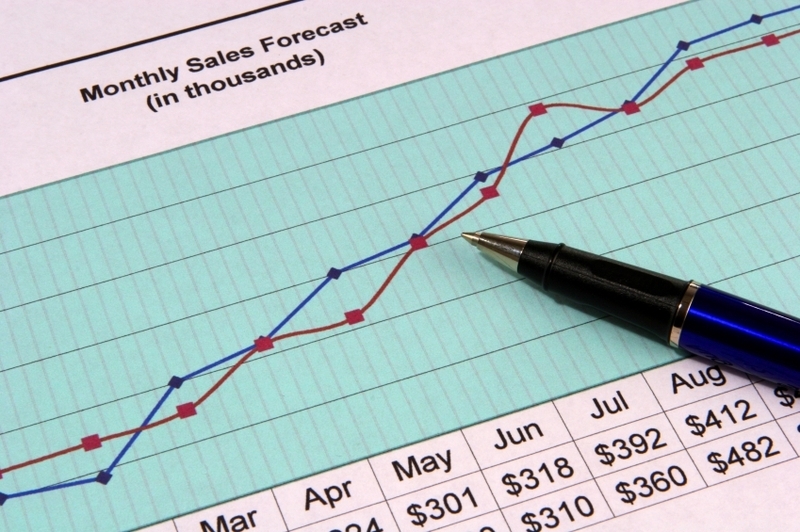 What about measuring sales beyond the sales numbers? How about what leads to sales, such as leads, or presentations, or proposals? You can measure calls taken, minutes per call. Some companies set an objective poll or survey, maybe even something as simple as what you can do at www.surveymonkey.com to measure intangibles like customer satisfaction. A software company might measure product quality by tracking support incidents, or incidents by type. It might also measure the effectiveness of support providers by measuring minutes per call, or calls per incident, or by taking a survey of customers after their service transaction is finished. I find that in general, developing the metrics required to bring your people into the planning process is very important. Get the people involved in how they are going to be measured. Often the team leaders fail to realize how well the players on the team know their specific functions, and how they should be measured. If you like trendy terms, the buzzword these days is scorecard. Business analysts use scorecard techniques to measure and track performance beyond the simple financial reports. I love metrics. Metrics in business means some specific set of numbers you measure and get measured by, ideally numbers that anybody can understand. You know you have metrics when you find yourself checking the numbers every morning, every day, or every hour. I think it's a good thing. It makes a game of it. You get a score. I'm a person who times myself when I run, and I run very slowly, but I still note whether it takes me more or less time on the days I do it. I like scores. I like to compete. I usually compete against myself and my past, but still, I like to compete. When I was with United Press International in Mexico City, many years ago, every day when we came into the office we had "the logs" as a metric. The logs were a scoring of how many newspapers used our story and how many used the competition's (Associated Press) story. The logs were like a football score. If more newspapers used my story than the AP story, I'd won. Scores were like 12-7, 4-3, 20-1 ... you get the idea. I still remember the one I won 23-1, a story about a mudslide. My lead was people "buried in a tomb of mud" and the newspapers liked it. Fast-forward to business today. Ideally, every person in the company has his or her own metric to watch. The CEO watches a bunch of them, of course, but the bunch is composed of lots of separate metrics. The customer service rep counts calls taken, or orders. The tech support rep counts issues resolved every day. The product development people watch returns, tech support issues per capita, and issue flow. The finance people watch balances, interest income, and margins. The online webmaster watch visits, pages, pay-per-click yield, orders, sales volume, and search placements. My vision of a company working well is people checking and sharing their metrics. They are accountable for metrics, and proud when they do well. The goals are built into the plan, and the actual results are compared against the plan regularly. The plan is reviewed and revised and the course is corrected based on, among other things, the metrics. Of course the metrics have to be the right metrics. Don't track somebody on things they can't control, and don't accidentally use metrics to push the wrong buttons. For example, years ago I had a sales manager who was tracked on sales dollars alone, who also controlled expenses and pricing. Sales went up but margins went way down. That was predictable. Track a customer service agent on call volume alone, or a tech support rep on issues handled, and customer satisfaction will suffer. The metrics should also be built around a reasonable plan. They need to be aligned with the plan, so they tie directly into strategy. And metrics have to be tracked. They are part of a larger planning process in which plans are kept alive and reviewed and courses are corrected as assumptions change. These days I am particularly happy with the flow of the metrics in my job. Until recently I was responsible for the entire company, the CEO. My metrics were all over the map. Sales, profits, cash flow, unit sales, payroll, health, wealth, and the pursuit of happiness, all of which was pretty vague and hard to track. Today I'm still president, but my job is about teaching, writing, speaking, and blogging. And blogging gives me a single set of metrics (traffic, page views, subscribers, etc.) I can watch and enjoy, or suffer, every day. Like back in the old days, at UPI. That's cool. Last spring, on baseball’s Opening Day, I confidently identified the Boston Red Sox on these very pages as the eventual World Series winner—based in part on their analytical prowess. You may recall that I was correct in that prediction. This Sunday, I will go out on a much more solid limb and pick the Patriots to triumph in the Super Bowl. I’m more of a baseball guy than a football nut, but fortunately both of the Boston teams I cheer for are not only winners of late, but also heavy users of analytical approaches to their respective games (the Celtics aren’t doing badly either, but I think Kevin Garnett is more of a factor in their success than any statistician). Like the Red Sox (or any analytically-oriented sports team, for that matter) the primary analytical application for the Pats is selecting the best players for the lowest price. This is particularly critical in the NFL, with its stringent salary cap. In-depth analytics helped the team select its players and conserve its dough. (Until last year the team had only a middle-ranking payroll in the National Football League, but now Tom Brady is getting expensive!) The team selects players using its own scouting services rather than the NFL-generic one that other teams employ; Brady, for example, was the 199th pick in 2000. They rate potential draft choices on such nontraditional factors as intelligence and willingness to subsume personal ego for the benefit of the team (though I had my doubts about their fidelity to that variable when they signed the famously mercurial Randy Moss before this season). The Patriots also make extensive use of analytics for on-the-field decisions. 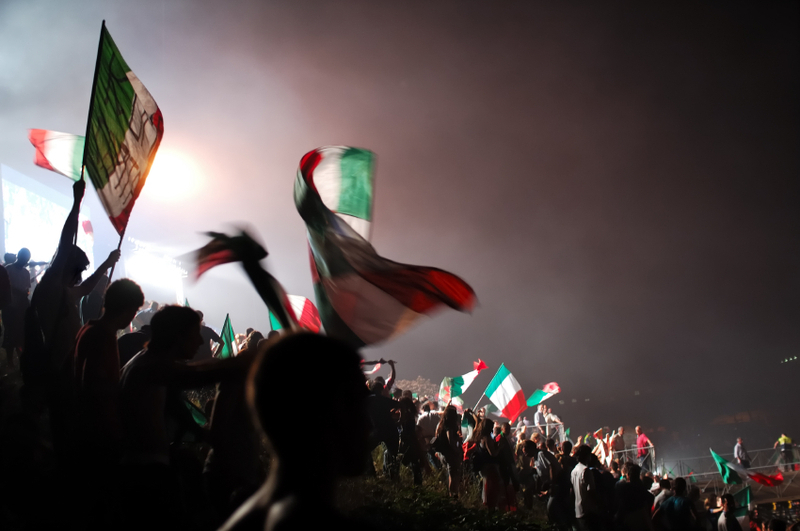 They employ statistics, for example, to decide whether to punt or “go for it” on fourth down, whether to try for one point or two after a touchdown, and whether to throw out the yellow flag and challenge a referee’s ruling. Both its coaches and players (particularly quarterback Tom Brady) are renowned for their extensive study of game video and statistics, and head coach Bill Belichick has been known to peruse articles by academic economists on statistical probabilities of football outcomes—over breakfast cereal, the legend goes. Off the field, the team uses detailed analytics to assess and improve the “total fan experience.” At every home game, for example, twenty to twenty-five people have specific assignments to make quantitative measurements of the stadium food, parking, personnel, bathroom cleanliness, and other factors. The team prides itself not only on scoring the most points ever this season, but also on having the lowest wait time for women’s restrooms in the NFL. External vendors of services are monitored for contract renewal and have incentives to improve their performance. This won’t help them win the Super Bowl, but it helps fill Gillette Stadium every home game. Belichick deserves a lot of credit for the analytical emphasis (God knows, he can’t get by on charm), but so do the team’s owners. Just as the Red Sox owner John Henry moved the Sox in an analytical direction, Bob and (especially, I’m told) Jonathan Kraft believed that analytics could make a difference in football. Jonathan is a Harvard Business School alumnus and a former management consultant. In addition to Belichick, they hired Scott Pioli, a former Wall Street investment analyst and now the “player personnel” guru. The only thing the Patriots lack is an analytical secret weapon equivalent to Bill James, the god of baseball statistics who acts as a “senior adviser” to the Sox. I’m not sure there is a Bill James of football. If there is, the Pats need to hire him (or her). Such a move could keep the Patriots dynasty going for many years to come. 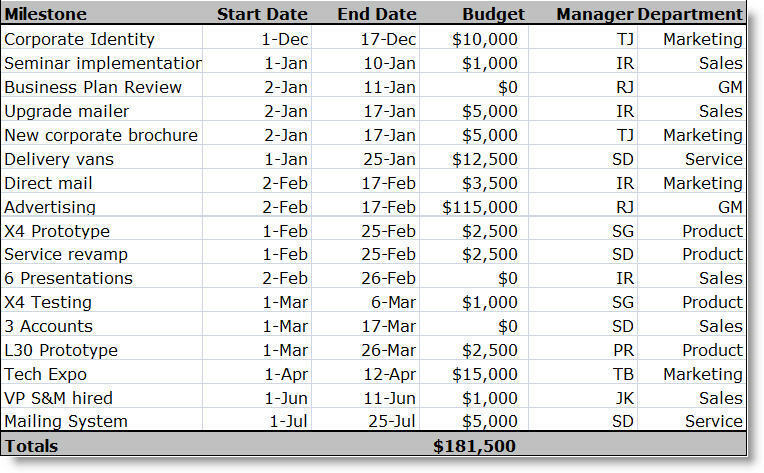 Use a milestones table to plan what's actually going to happen. I have a simple example here. It's not much more than a list of what's supposed to happen, when it starts, when it finished, what's the budget, who's in charge, and -- in this example, at least -- which department is responsible. To me it's the most important table in a business plan, because it's so obviously important for tracking progress and making your planning part of your management. You don't need to get sophisticated with the milestones. A good list is enough. 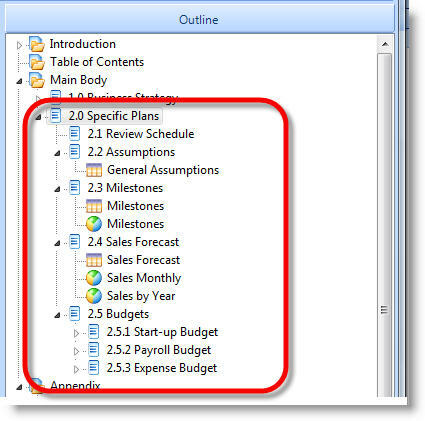 Using simple software (meaning Microsoft Excel, Apple iWork, Lotus 1-2-3, and of course, Business Plan Pro), you can sort the list by date, by manager, by department, so you can, for example, use these milestones as agenda setters for the review meetings. Sort by manager to set the discussion points when you work with the people on your team to set expectations and follow up by reviewing results. 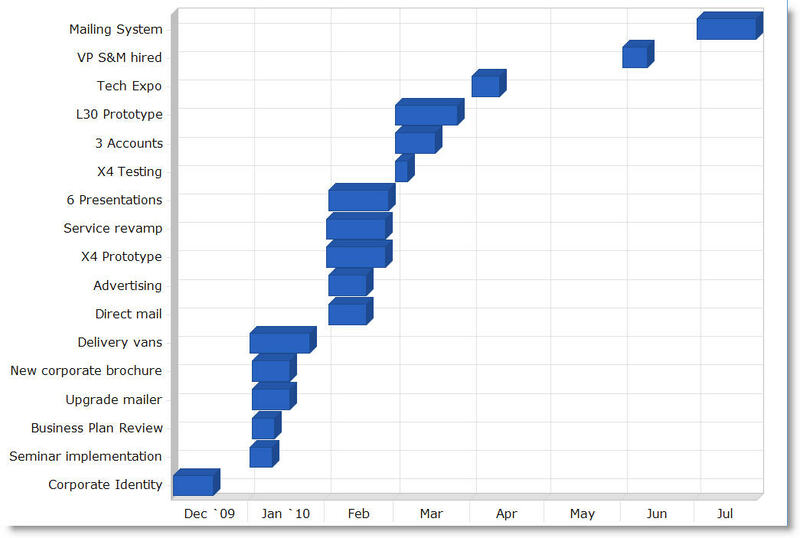 When and if you're thinking about plan document output, a set of milestones makes a good chart, like the one below. This is the bread and butter of real business planning. 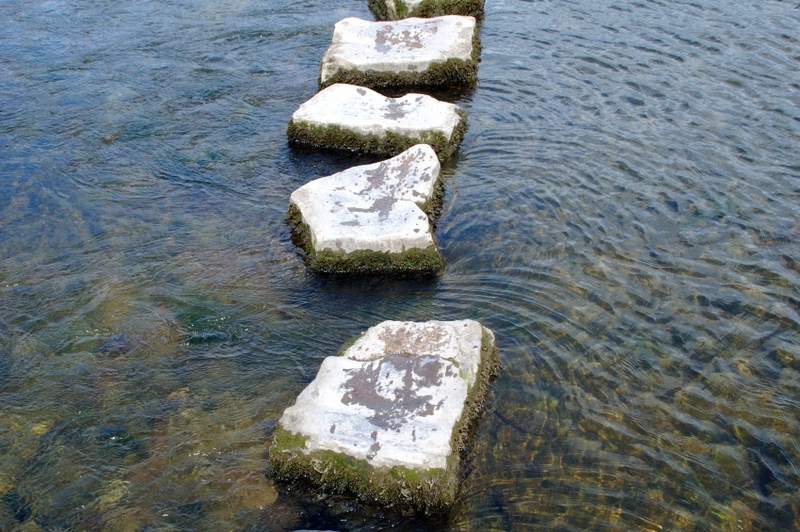 You can't build implementation unless you put it into meaningful steps. Then, of course, you have to follow up on it, make it happen. Management is setting expectations and following up on results.